Hey, carnation lovers. You know who you are. You dream of Caron Poivre Extrait and hoard old bottles of Bellodgia. You lard your linen closet with discs of Roger & Gallet Carnation soap and mourn their discontinued Blue Carnation. You plant red dianthus up your walkway. You put extra clove in your molasses cookies. I have news. First, I hear on good authority that carnations are making a comeback among chic florists. I’m not talking about fat, stiff grocery store carnations dyed Easter egg colors. I mean real carnations, the little ones pungent with spice. 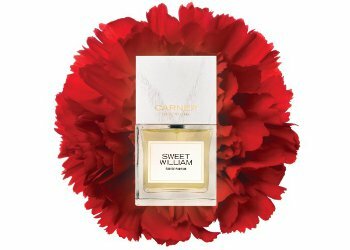 More good news: to inhale the aroma of carnations in a modern yet irony-free way, Carner Barcelona Sweet William is a sure bet. Perfumer Rodrigo Flores-Roux developed Sweet William. Its notes include white pepper, cardamom, cinnamon bark, galangal (type of ginger), dianthus superbus scentrek (a headspace-derived carnation), ylang ylang, rose water extract, tobacco flower, Ambrarome (a synthetic ambergris), styrax, Florentine iris, and vanilla absolute. Sweet William delivers carnation dusted with pepper and mixed with a modest helping of spice and vanilla. Otherwise, it’s a straightforward carnation perfume. It’s not a crisp green carnation straight from the garden, but a warm carnation with a sheer heart. Unlike vintage carnations like Bellodgia or Jean Patou Adieu Sagesse, it doesn’t mess around with an opaque baroque framework, but is happy to be a featherweight shawl of relatively uncomplicated scent. For some people, Sweet William’s simplicity might be its greatest drawback. Carnation soliflores don’t get a lot of love these days. They can seem prissy and old fashioned and not all that interesting. Perfume brands seem to agree. Recent carnation-centered fragrances like Aedes Oeillet Bengale and Une Nuit Nomade Memory Motel stylize the flower to iron out its Victorian ruffles. That said, clean white sheets after a hot bath aren’t groundbreaking, either, but they’re one of the finest treats of daily life. Sweet William dries down to a soft woody vanilla with a freshly sanded texture. It lasts a companionable half the day on my skin. I'm starting to agree with my favorite florist: maybe it's time for carnation's comeback. Are you a fan of carnation? What are some of your favorites? Carner Barcelona Sweet William Eau de Parfum is $180 for 100 ml and $120 for 50 ml. For information on where to buy it, see Carner Barcelona under Perfume Houses. This sounds pretty. I love carnation, both in real life and in perfume. Etro Dianthus and En Voyage perfumes Fiore di Bellagio are favorites and L’air du Temps, of course. My mother has worn LdT for many years. I always think of L’air du temps as a lily fragrance, but now I will focus on its carnation, thank you! Lovely to see another review from you. I discovered Sweet William last year when it was launched in spring and it was by far my favorite from Carner Barcelona white (floral) collection trilogy. I do love carnation and clove smell in my perfume – perhaps that’s why I like Prada Infusion d’Oeillet so much. Pretty overpriced carnation I dream of having is Guerlain Lui (for the bottle too!) and Derby. I’ve been lucky enough to sample Lui, and it’s really nice. I know, I like smaller bottles, too! And thank you for bringing up the Prada carnation. I love the smell of real carnations and am looking forward to trying this. I am also making note of the other carnation scents mentioned here. Carnations seemed to be used a lot in perfume, but they aren’t the center of the perfume too often, it seems. I like them! I love carnation! I have a box of three Carnation soaps in my closet: so clove-laden and intoxicating. I have a good six bottles of vintage Bellodgia, one of which is the first vintage perfume I’ve ever bought. I have a bottle of the reissued Oeillet Sauvage and may I say, it does what it needs to do. I’m usually hesitant to try new carnations but I’m going to have to give it a go. Thanks Angela! I posted this while my lunch date was in the restroom and then noticed the centerpiece on our table was pink carnations. A sign! Aha! You excel at the same kind of sign-finding I do. It sounds like for you it’s worth a sample, at least! That sounds wonderful! Do you keep your sheets in there, too? Santal-scented sheets would be terrific. I do! The whole cupboard will smell of Sandal for YEARS. I have four bars of R&G Carnation soap in my sock-and-underwear drawer, one in its dish plus a backup box of three, and it’s heaven. Carnation is probably my second favourite note in all of perfumery (after oakmoss), and I regularly wear CdG Carnation, Guerlain Terracotta Voile d’Ete, and Caron Coup de Fouet. Caron really had at it with the carnation, didn’t they? I’d forgotten about Coup de Fouet. A good one. I recently bought a rollerball of Cinnamon Projects 11 PM Accord perfume oil. It lists notes of carnation, amber, clove, and patchouli. I had never even heard of this brand, but it was one of the items on sale at Lucky Scent after Christmas, and the listed note of carnation caught my eye. It is a rather quiet scent that wears close to the skin, but the carnation is definitely there. I’ve never heard of that brand, either. Thanks for alerting us! I enjoyed reading this review, and I do enjoy the scent of carnations. Caron Bellodgia and Piu Bellodgia are favorites, as well as L’Artisan Oeillet Sauvage. I also think Prada Infusion d’Oeillet is a beautiful fragrance. It’s been a long time since I’ve smelled Oeillet Sauvage. I wonder if it’s still in production? Too bad! I know they discontinued part of their line. I just posted DSH’s Fleuriste as my sotd. It’s primarily a carnation scent, but I find it to be more floral and softer than the current norm for that note. I find that many carnation scents tend to enhance the spicy aspects and veer into warm oriental territory or else choose to go towards spikey green territory. Fleuriste is a soft-focus floral carnation without any sharp edges. It’s warm and comfortable and as reassuring as a soft flannel baby’s blanket or a calico apron. Smelling it instantly reminded me of the original Johnson & Johnson’s pink baby lotion, Camay soap and the very simple pleasures of my childhood. It sounds so soft and comforting! I haven’t tried this one yet. Thank you for the recommendation. I love Fleuriste as well and think it is definitely worth trying, Angela. I don’t experience it the same way as Holly does, however. I find it a beautiful, slightly spicy green carnation, cool rather than hot. I believe it is supposed to capture the smell of a florist shop. When I think of florist’s shops, I definitely think of cool and wet and green. I’m very curious about Fleuriste now. Wow. I will have to check this out. However, as a big fan of carnation scents, I already have a ridiculously large number of them so…. My favorites include vintage Bellodgia extrait and Adieu Sagesse but also Prada No. 2 Oeillet and DSH Fleuriste (so beautiful and still available!). The solifore I like best is Carnation by Laboissiere. People who love carnation should definitely check out DSH because she has several different carnations, all of which are well done, including Oeillets Rouges and Souvenir de Malmaison (which, though a lovely ambery carnation, does not smell like Floris Malmaison). I have also been growing a few different kinds of dianthus in my yard. They are so pretty to look at as well as to sniff. And I have definitely observed they are trending in the plant nurseries. I particularly like a striped one with a dumb name: Pinball Wizard. Thank you for the tip on DSH’s carnation fragrances! You’re right–Pinball Wizard is a pretty stupid name for a great flower. I do love dianthus in the garden for a million reasons, though. It’s so easy to grow and to tuck in here and there. Another vote for DSH’s carnations! They’re lovely. I posted a comment the other day about having the original Opium way back when – carnation was always the prevalent note for me in this fab fragrance. I have some old Opium around somewhere. I’ll have to dab it on soon! Love carnation. Love Oeillet Bengale, even though it’s actually rose. And Fiori di Capri, which is one of my favorite carnations. Maybe I’ll finish up my sample of the Prada to orrow…. I really don’t know much about this note- but had seen a comment by a famous musician turned perfumer that his personal scent would be carnation. That intriqued me- now I feel I should try both Fleuriste and Carner! Wow- Camay soap – loved it and hadn’t thought of it in years!! Mind blown! I bet you’d know carnation if you smelled it. It’s a classic spicy floral note. I hadn’t thought of Camay in years, either! Nice review Angela! Makes me miss the beloved R&G oeillet soaps. Those went away for awhile and were selling on line for like 80 bucks for a single soap. Then they miraculously reappeared at Colonial drug in Newtonville MA at normal prices. Not sure if you can get them any more. Sweet William sounds worth a try. I used to love them, too, then sort of lost track of them. $80 a bar! Outrageous! Check out the Garofano (carnation in Italian) from Santa Maria Novella. Oh yes! I remember that one. There are more carnation soliflores out there than I’d remembered! Yes, they have a cologne, which is a refreshing citrusy carnation. Very nice in the heat! But in this case I was referring to the soap as a possible replacement for the R&G soap. Oriza Legrand do a really beautiful carnation perfume….in fact they do two but I’ve only tried Royal Oeillet. It’s a beautiful fresh powdery slightly peppery carnation. It has a sprinkling of cloves and the drydown is sweet vanilla cloves. They also do Oeillet Louis XV which apparently is another carnation with a woody element to it. It’s a a French company who post worldwide, have a great sample service and now do a 50 ml and 100 ml size. Fantastic old school perfume house and I have Chypre Mousse, Reve d’Ossian as well as Royal Oeillet. Ooh, I have not tried that one. Sounds gorgeous! I’ve been super curious about that line! Fumerie carries it, and I’ll have to drop in and sniff a few. Thanks for the heads up! Definitely worth checking out! Chypre Mousse is very different and an absolute love it or loathe it! I love it! Thank you for the lovely, evocative review, Angela. It’s a note I’ve always loved and glad if it’s making a comeback. I think clove is somewhat restricted in its use in fragrances these days, I remember the Roger & Gallet of my childhood (I was raised in France) being headier, I suppose that role is filled by things like pink pepper these days, and Caron’d iconic oeillet fragrances are no longer their regal selves, I still like modern Bellodgia as a fresh rain of carnation, it’s the drydown that is lacking. I also like some modern renditions, Dianthus is a big favorite, so soft and transparent but long lasting and there is Malmaison (I now live in the UK so tracked a bottle easily and cheaply) and l’Air du Temps, I have a parfum de toilette still very fresh and so potent – vintage edt is often wan, and extrait is not as stable as pdt. And I am reminded by reading Kate’s comment that I have the Oriza Legrands to try from my box of samples. Wow, how wonderful that you found Malmaison! That’s a great one. If you care to share how you found it, I’d love to know. Hello: I found it at eBay.uk, bottles come up time to time – one has to be patient – and are still quite affordable, I hope you can get hold of one too wherever you are. I’m in the US but my son lives in Liverpool. So I suppose I could use his address? Oh, yes, you could do that, good luck! Aurora DO try the Oriza perfumes…..they are def old school but beautiful! You’re a good friend! It would be so tempting to hoard them. I didn’t know about these soaps, thank you so much! By the way, it is so fun to see so many carnation lovers! I’m just ridiculously obsessed by it. I think it’s because I find that note not just beautiful but very uplifting. The spiciness is like a little caffeine jolt. Carnation is one of those notes, like violet, that has its real fans! I’ve never sniffed real carnations although plenty of carnations are sold in Dutch florist shops. Probably not the fragrant kind. I’m lucky enough in that I’ve smelled vintage Caron Poivre and Coup de Fouet. Loved those. But apparently the reformulations are not as good. I too am a fan of Œillet Mignardise soap, especially to scent my sock drawer. (Why socks I wonder now?) Agree with Kate that the two Oriza’s are very nice although I happen to prefer Fillet Louis XV to the Royal one. And serendipitously my last perfume purchase of last year was Œillet Bengale! I love the name Thousand Beauty! It sounds like you are well grounded in carnation for the new year. There’s a store here selling CD scents, although it’s All Things Dudely and might not sett the girlier ones. I do like CdG’s carnation from the Red series, although it’s quite evanescent. All Things Dudely? Seriously? I guess that’s one way to reel in the young man department….. I still have my Sweet William from Ineke that I won from an NST giveaway some years back; I remember it being a very, very, strong, rich fragrance, like, maybe one, two spritzes are all that is needed. I think I shall give it another spin tomorrow, the cold weather would seem better for it. Nice score! I haven’t tried the Ineke Sweet William. Enjoy it! I first tried CB Sweet William this last spring at a perfume shop in Seattle. It was one that I sprayed on a paper strip, and I kept sniffing the paper as long as it retained the scent. I ended up buying a set of spray samples of it on eBay a couple months back. Thanks for writing about this lovely perfume. I will wear it again soon, and it I hope someone is still thinking of your review and splits it for the next splitmeet. Another good DSH carnation that hasn’t been mentioned is L’Opera des Rouges et des Roses which is a rose carnation blend. It’s part of the Giverny in Bloom line. DSH really does love her carnations! Thank you for adding that one to the list.